Adds the nice water pumps just outside each Hearthfire home. The pump is tied to the construction of the garden and will appear when it is built. Thicketford for his Water Pump mod, without which, this mod would be neither needed, desired, or possible. Ro84 for his port of Realistic Needs and Diseases, without which, Thicketford would probably not have written his mod. 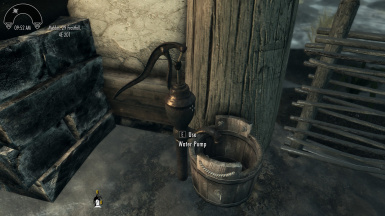 Simply adds a water pump from Thicketford's Water Pumps for Player Homes﻿ to each of the Hearthfire homes. The pumps are part of the garden and will appear once each garden is built. All are near the front door to the home and there may be compatibility issues with other mods that modify that space. They are not immediately next to the steps so some modification may not be an issue. Feel free to send a PM or post if a patch is needed to accommodate a particular Hearthfire Home external mod. There are four files included in the mod. The first and default file is an all-in-one merged plugin that covers all three homes. The other three are individual mods for each home.